3 Genius Ways To Mix Indian & Western For A Fab Fusion Look! Both Indian and western outfits have a charm of their own. While they may seem to be poles apart, they aren’t quite in reality. When you merge these two diverse trends together, you’re left with a brand new combination! Indo-western outfits not only look fabulous, but they also make a huge fashion statement. If you want to know how to mix and match Indo-western outfits, simply watch this video! Watch the video NOW! You can style your favourite skirt in two ways - with a tank top or denim shirt. The tank top worn with an ethnic skirt makes a perfect outfit to wear to college. If you aren’t too comfortable with just wearing a tank top, a denim shirt would work wonders too. Take your pick, ladies! Also read: How To Style Indian Wear To Work: Top Tips From Team POPxo! You can either choose a cotton anarkali or a long kurta for this look. You can wrap a thin waist belt to add a western touch to it. If the anarkali or long kurta is button downed, has a zip on or has a slit like Komal’s anarkali in the video, you can try pairing it with a pair of denims or palazzos. To complete the look, you can finish up with a pair of heels and a lovely sling bag. 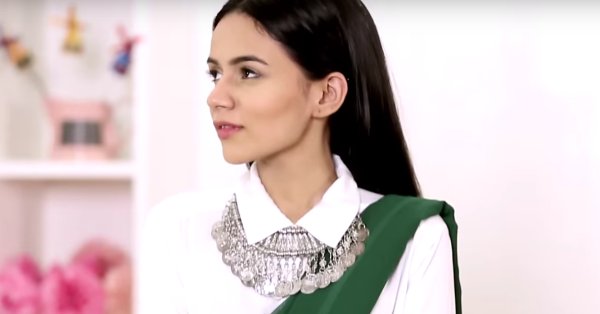 Also watch: 5 New & Exciting Ways To Style Your Patiala! If you’re tired wearing your saree with a crop top or a regular blouse, a crisp white shirt is a fantastic option! If that’s not your cup of tea, you can always try clubbing it with a cape. It will not only give it a classy vibe, it will also make heads turn for sure! Also read: 9 Stunning Necklines For Your Sari Blouses!